Security is my top priority! This website utilizes some of the most advanced techniques to protect your information and personal data including technical, administrative and even physical safeguards against unauthorized access, misuse and improper disclosure. I will not share or trade online information that you provide (including e-mail addresses). 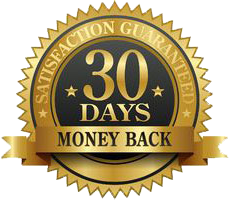 "I have used the Syndicated Deal Analyzer and everything that Michael taught me to analyze over 20 deals. It has cut down on the time it takes to come up with an offer price so that I can make more offers. I just closed on my first large apartment building deal, a 32-unit, and am confident that I can do another one or two deals this year. And I'm happy to report that two weeks ago I quit my job! A dream come true. Thanks, Michael for all your help!" "Don't Ever Change How You Teach - You're AWESOME!" "I just closed on my first deal, 10 units in upstate NY. I purchased it for $190K and paid myself an $8,000 acquisition fee at closing. I raised the money from an investor and so I have none of my own money in the deal. The property is already worth a lot more than what I paid for it and I’ll refinance in a few months. Michael, I’d like to thank you for your apartment buying system and for the personal coaching. You helped me do my first deal, and I’m already working on several (larger) ones." "I Did My First 22-Unit Deal in 3 Months (Thanks Michael!)" "My First Deal Added $8,000 per month to my Income"
"I closed on my first apt building deal, a 130+ unit in the Dallas/Ft Worth metroplex. 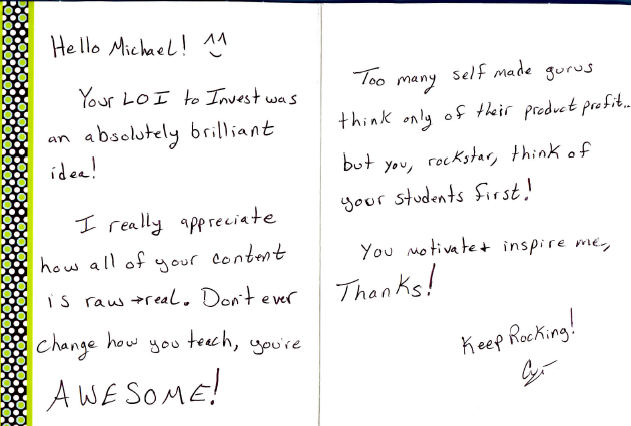 After completing Michael's program, my confidence in analyzing deals and making offers skyrocketed. I was then able to analyze, negotiate, and put this property under contract. It took a LOT of work, but with determination and Michael's support we were able to get it done. I've added about $8,000 to my monthly income, and I'm already pursuing my second deal. Thanks, Michael, for all your help!" "I'm About to Quit My Truck-Driver Job!" "I'm a truck driver for UPS and am close to quitting my job because of apartments. I bought a 4-plex and 5-unit with a combination of some savings and a hard-money lender that I was able to finance out. I'm now 50% towards my Rat Race number and I think I’ll be able quit my job in the next 6-12 months. 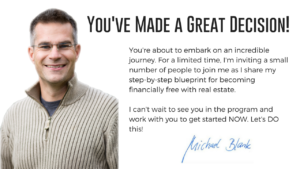 I want to thank Michael for all of his help and tools: the Syndicated Deal Analyzer and mastermind program have been invaluable in helping me get to this point."